It's August 1999 and sisters Cassie and Olive Warren are visiting their grandparents in Bishop's Green, England for the summer. The girls, ages 13 and 11, are eagerly looking forward to the solar eclipse. Cassie, the oldest, shares an intimate friendship with Marion and sometimes resents having to watch over her little sister, but Olive is well behaved and will listen to her. What she doesn't anticipate is that Olive will wander off into the crowd of onlookers only to disappear and never be found again. This is something Cassie takes to heart with unbearable guilt. In addition to Olive being taken, their parent's somewhat shaky marriage crumbles, and their dad leaves to marry another woman and start a new family. Several years later, Cassie's mom, unable to bear the strain of loss commits suicide, which further plunges Cassie into despair making her turn to alcohol and sleeping meds to chase away the demons. Now it is March 2015 and Cassie has lost her London journalist position. She moves back to Bishop's Green to care for her grandmother who is suffering from dementia. Hesitant to return, but with no job or prospects, and seeing that her grandfather had passed months earlier, Cassie understands there is no one else to help with Gran. She finds the town much as it had been years ago and realizes she must face her fears, especially when it is reported a young girl named Grace has just gone missing. "I tried to clear my head. Olive's ghost was making me itch, her cold, eleven-year-old hands tracing my spine like they hadn't in years." Marion and Cassie's reunion is chilly at first, with Marion warning Cassie that Grace's disappearance has nothing to do with Olive’s. She suggests Cassie drop her inquiries and let the police handle the situation, but Cassie cannot. She has to dig deeper and hopefully also find out what happened to her beloved younger sister. Several suspects arise, and after a week, Grace is found with her father who took her on holiday without notifying anyone. Sighing with relief however is short-lived when Grace's best friend Bella turns up missing—and on the morning of the eclipse. "My head felt too full, bouncing between thoughts so fast I felt dizzy. None of it made sense. There were too many threads and too many people to keep track of." Meanwhile, Cassie receives text messages warning her to back off. Then when Gran is hit by a car and hospitalized, she wonders if she is being targeted. Could she be getting close to the answers she seeks? This tale segues between the past and the present, told in the voices of both Cassie and Olive, bringing reader on a wild ride filled with tension, suspense, and intrigue, while witnessing cruelty that's hard to fathom. 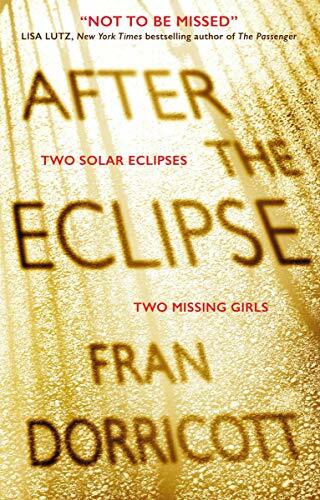 A debut novel, written with insight and empathy as well as hair-raising suspense, After the Eclipse is sure to pique the reader's interest.